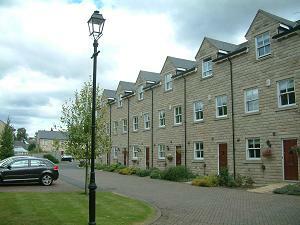 In the heart of Kerridge, a small cul de sac of mostly three story stone faced terraced homes built around 2000. Open hillside to the south towards Kerridge Hill and White Nancy. Nearest shop – Greenfield Road. Jackson Close was developed on the Eric Britton manufacturing site and replaced a very modern design of building put up in the 1970s(?). This building was not at all in keeping with the area and while there were strong objections to the present development, mainly because of the height, it is widely accepted that the houses are a great deal better than the previous factories.